[S6] G.E. Cokayne; with Vicary Gibbs, H.A. Doubleday, Geoffrey H. White, Duncan Warrand and Lord Howard de Walden, editors, The Complete Peerage of England, Scotland, Ireland, Great Britain and the United Kingdom, Extant, Extinct or Dormant, new ed., 13 volumes in 14 (1910-1959; reprint in 6 volumes, Gloucester, U.K.: Alan Sutton Publishing, 2000), volume III, page 311. Hereinafter cited as The Complete Peerage. 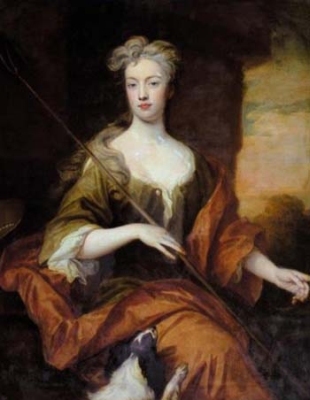 Lady Sophia Osborne was born in 1661.2 She was the daughter of Thomas Osborne, 1st Duke of Leeds and Lady Bridget Bertie.1 She married, firstly, Donogh O'Brien, Lord Ibracken, son of Henry O'Brien, Lord O'Brien and Katherine Stuart, Baroness Clifton (of Leighton Bromswold), on 26 May 1679.1 She married, secondly, William Fermor, 1st Baron Leominster, son of Sir William Fermor, 1st Bt. and Mary Perry, on 5 March 1691/92. She died on 8 December 1746. She was buried on 17 December 1746 at Easton Neston, Northamptonshire, EnglandG. From 26 May 1679, her married name became O'Brien. From 5 March 1691/92, her married name became Fermor. [S6] G.E. Cokayne; with Vicary Gibbs, H.A. Doubleday, Geoffrey H. White, Duncan Warrand and Lord Howard de Walden, editors, The Complete Peerage of England, Scotland, Ireland, Great Britain and the United Kingdom, Extant, Extinct or Dormant, new ed., 13 volumes in 14 (1910-1959; reprint in 6 volumes, Gloucester, U.K.: Alan Sutton Publishing, 2000), volume X, page 573. Hereinafter cited as The Complete Peerage. William Fermor, 1st Baron Leominster was born circa 1648. He was the son of Sir William Fermor, 1st Bt. and Mary Perry.2 He married, secondly, Hon. Catherine Poulett, daughter of John Poulett, 3rd Baron Poulett and Essex Popham.3 He married, firstly, Jane Barker, daughter of Andrew Barker.3 He married, thirdly, Lady Sophia Osborne, daughter of Thomas Osborne, 1st Duke of Leeds and Lady Bridget Bertie, on 5 March 1691/92. He died on 7 December 1711. [S6] G.E. Cokayne; with Vicary Gibbs, H.A. Doubleday, Geoffrey H. White, Duncan Warrand and Lord Howard de Walden, editors, The Complete Peerage of England, Scotland, Ireland, Great Britain and the United Kingdom, Extant, Extinct or Dormant, new ed., 13 volumes in 14 (1910-1959; reprint in 6 volumes, Gloucester, U.K.: Alan Sutton Publishing, 2000), volume VII, page 613. Hereinafter cited as The Complete Peerage. [S6] Cokayne, and others, The Complete Peerage, volume X, page 573. 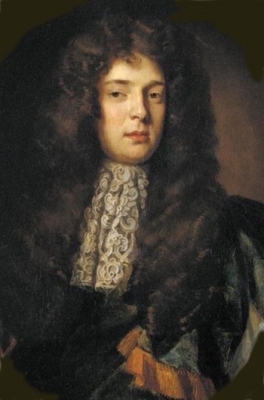 Henry Horatio O'Brien, Lord O'Brien was born circa 1670.1 He was the son of Henry O'Brien, 6th Earl of Thomond and Sarah Russell.2 He married Lady Henrietta Somerset, daughter of Henry Somerset, 1st Duke of Beaufort and Mary Capell, on 24 June 1686.1 He died on 10 July 1690, from smallpox.1 He was buried on 15 July 1690. Lady Henrietta Somerset was born circa 1669/70. She was the daughter of Henry Somerset, 1st Duke of Beaufort and Mary Capell.1 She married, firstly, Henry Horatio O'Brien, Lord O'Brien, son of Henry O'Brien, 6th Earl of Thomond and Sarah Russell, on 24 June 1686.1 She married, secondly, Henry Howard, 6th Earl of Suffolk, son of Henry Howard, 5th Earl of Suffolk and Mary Stewart, circa 1 May 1705.1 She died on 2 August 1715 at Audley End, Essex, EnglandG.2 She was buried on 14 August 1715 at Saffron Walden, Essex, EnglandG. From 24 June 1686, her married name became O'Brien. From circa 1 May 1705, her married name became Howard. After her marriage, Lady Henrietta Somerset was styled as Countess of Bindon on 30 December 1706. [S6] G.E. Cokayne; with Vicary Gibbs, H.A. Doubleday, Geoffrey H. White, Duncan Warrand and Lord Howard de Walden, editors, The Complete Peerage of England, Scotland, Ireland, Great Britain and the United Kingdom, Extant, Extinct or Dormant, new ed., 13 volumes in 14 (1910-1959; reprint in 6 volumes, Gloucester, U.K.: Alan Sutton Publishing, 2000), volume II, page 177. Hereinafter cited as The Complete Peerage. [S6] G.E. Cokayne; with Vicary Gibbs, H.A. Doubleday, Geoffrey H. White, Duncan Warrand and Lord Howard de Walden, editors, The Complete Peerage of England, Scotland, Ireland, Great Britain and the United Kingdom, Extant, Extinct or Dormant, new ed., 13 volumes in 14 (1910-1959; reprint in 6 volumes, Gloucester, U.K.: Alan Sutton Publishing, 2000), volume III, page 96. Hereinafter cited as The Complete Peerage.